The 12 Days Gorilla & Wildlife Safari in Uganda and Tanzania commences in Entebbe Uganda and ends in Arusha Tanzania taking you to the rewarding sites in these two destinations. The Safari majorly features Mountain gorilla trekking and Chimpanzee trekking in Uganda’s bio diverse forests and extensive game viewing experience in Tanzania famous savannah parks. The places to visit include; Kibale National Park, Queen Elizabeth National Park, Bwindi Impenetrable National Park, Lake Manyara National Park, Serengeti National Park and Ngorongoro Conservation Area. Your flight eventually arrives at Uganda’s main gateway – the Entebbe International Airport where you will be welcomed by the driver guide and after meet and greet, you transfer to the hotel for relaxation, dinner and overnight. After breakfast at the lodge, you embark on the 300km drive about 4 – 5 hours to Fort Portal enjoying the impressive views of the countryside including the en route towns of Mityana, Mubende and Kyenjonjo. The Mubende Inselbergs, the distant views of Lake Wamara and the lush tea plantations are also exciting to explore along the drive. Upon reaching Fort Portal town, you settle for lunch after which you will spend the afternoon visiting the Amabere g’Nnyinamwiru caves exploring the history behind this rich heritage site with the beautiful Nyakasura falls flowing over the caves in the rainy season. The breast-like features are traditionally known to be breasts of Nnyinamwiru the maiden daughter of Bukuku the self enthroned King of the Bachwezi who denied his daughter a chance to breast feed her son Ndahura in fear that the grand child would take over his throne. You also undertake a hike to the Fort Portal crater field summiting the famous Kyeganywa hill offering uninterrupted views of the surrounding crater lakes and crater hollows. Retreat to Kibale Area for relaxation, dinner and overnight. The morning is dedicated to Chimpanzee trekking encounter commencing with briefing at 8am at Kanyanchu Tourism Center. Kibale is a verdant forest marked by lush flora including tall and mature trees that are over 50m tall and 200 years old, 375 species of birds including the Green Breasted Pita and Kibale ground thrush and 13 primate species which include; common chimpanzees, the Black and White colobus monkeys, Olive Baboons, Vervet Monkeys among others. 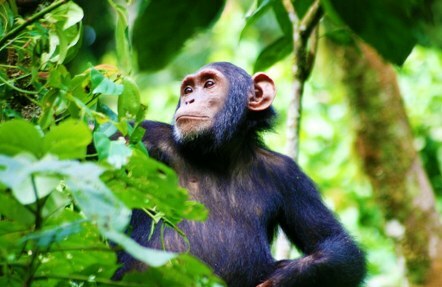 The Chimpanzee trekking takes about 2 -5 hours and includes one full hour of chimpanzee viewing encounter. Retreat from the activity and embark on 157km about 3 hours transfer to Queen Elizabeth National Park enjoying the scenic views of the snow capped Rwenzori Mountains en route. Retire for relaxation, dinner and overnight. The game drive starts at 6am if you slept inside the park and 7am if the lodge is outside the park gates taking you to Kasenyi plains where the range of wild game are known to thrive and a breeding ground to many. The 3 – 4 hour encounter offers possibility of exploring wild game like lions, elephants, Buffaloes, leopard, the Uganda Kobs, defassa waterbucks, wart hogs, bushbucks, Topis among others. 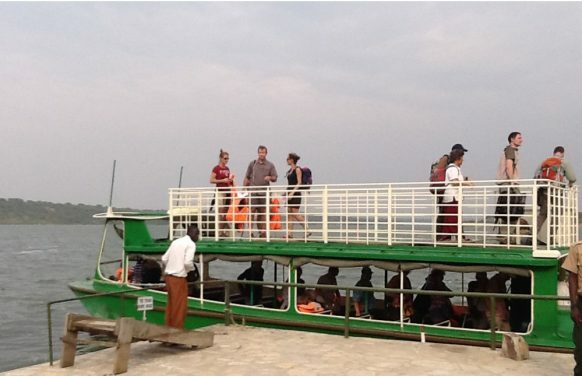 The mid day siesta can be spent at the lodge or in Mweya peninsular taking lunch before gathering at Mweya jetty for a two (2) hour boat cruise along the magical Kazinga Channel. The channel shores offer impressive views of the wild game drinking water including Buffalos, Elephants and a range of antelopes, the range of bird species including Great Cormorants, African Skimmers among others and aquatics like Nile Crocodiles and Hippos. The evening game drive along the channel track as you connect to the lodge offers more wild game views and the sunset views over the savannah. After breakfast, embark on the transfer to Bwindi Impenetrable National Park to the south of Queen Elizabeth National Park. Ishasha sector in the south of Queen Elizabeth National Park is another wild game viewing haven and a home to the famous tree climbing lions. A 1 – 2 hour game drive en route to Bwindi is a rewarding adventure to undertake as you gain possibilities of viewing them hanging on the fig tree branches in the mid morning sun. Proceed to arrive in Bwindi Impenetrable Park for relaxation, dinner and overnight. The gorilla trekking activity commences at 8am with briefing by the park rangers about the conduct of the activity after which you set off to the forest in search of these critically endangered apes. The gentle giants thrive in the dense forested landscapes in rugged mountainous ecosystem of Bwindi which presents a rather challenging trek as you traverse the steep hills, slop down narrow valley and cross streams. The forest also features lush flora and a myriad of bird species. 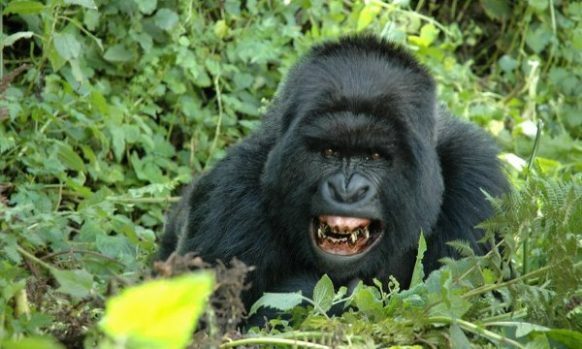 The moment with gorillas is limited to one hour but the entire trek can range from 2 – 8 hours. Retreat from the activity and spend the afternoon relaxing at the lodge. You can take an optional community tour visiting the Batwa people one of the last groups of short people left in the world. Embark on the transfer to Kigali International Airport in Rwanda to catch up with a flight to Kilimanjaro Airport and connect to Arusha for overnight. After breakfast, embark on the transfer to Lake Manyara National Park and upon arrival, you take up a village walk in the Mto Wa Mbu where you have an opportunity to explore the local community and their traditions including methods of food preparation, local banana beer brewing, the Makonde wood carvings and eventually settling for a traditional lunch which you participated in its preparation. In the afternoon, you enter the park for a game drive offering possible views of tree climbing lions, Zebras, warthog, baboon, giraffe, elephant, impala, hippo and wildebeest. Retire for relaxation, dinner and overnight. Embark on the transfer to Serengeti National Park – the Seronera Valley in the heart of the park featuring short grass plains featuring a wide range of animals stretching to the furious lions to the mongoose. The game drive commences upon entering the park gates until you approach the lodge for overnight. Also referred as the world’s famous wildlife safari park, Serengeti National Park’s endless plains feature the great count of animal population on earth including the great big cats like thousands of lions, Tanzanian Cheetah, leopards, Jackal species among others, Herbivores like millions of Wildebeest, hundreds of thousands of elephants, Zebras, Thompson Gazelles, Buffaloes not forgetting bird species. After breakfast, embark on the drive to Ngorongoro Crater enjoying the beautiful countryside. Settle for lunch upon arrival and then slope to the crater for an afternoon tour experience. Standing as a UNESCO world heritage site, Ngorongoro crater still feature its ancient landscape with a large intact and inactive unfilled volcanic caldera and among the few places on earth where a diverse and great animal concentration can be explored. The Big five thrive in the crater. Retire for overnight. You drive back to Arusha to catch up with the flight back home or onward connection to Zanzibar. Gorilla Valley lodge is a midrange / standard accommodation establishment that is located in Rushaga region in the south of Bwindi Impenetrable National Park. Bwana Tembo Safari Camp is a midrange / standard accommodation establishment owned and operated by an Italian family that came to Uganda in the year 1986. Bwana Tembo Safari Camp is positioned at 10km from the Tangi gate to the north of Murchison Falls National Park. Mburo Safari Lodge is a midmarket inclined to Luxury accommodation on the border of Lake Mburo National Park. The lodge is positioned on a raised hill offering a panoramic view of the park. Budongo Eco Lodge is a midrange/ standard accommodation in the Kaniyo Pabidi forest an extension of Budongo Central Forest Reserve accessed through the Kichumbayobo gate in the south of Murchison Falls National Park. Budongo Eco Lodge also has provision for the budget rooms that caters for the low cost travellers on safaris in Uganda. Papaya Lake Lodge is positioned at 350km from Kampala the Uganda’s Capital City on the boundary of Kibale National Park in the Ndali Kasenda Crater Field. The region in which it is located features twenty (20) extinct volcanic crater fields that present a range of lakes coming with unique shapes, color and size. The Papaya Lake Lodge also overlooks the magical Rwenzori Mountains that is snowcapped. Imperial Royale Hotel opened in 2007 offering Luxury / Upmarket accommodation to the Uganda safari undertakers and other guests in Uganda. Bunyonyi Safari Resort is a midrange / standard accommodation on the shores of Lake Bunyonyi in the Kagalama village overlooking the lake. OTHER Short Murchison Falls National Park Safari tours in Uganda.